Today I am sharing a sensory activity that also enhances motor skills, is cost effective and is perfect for rainy days, which if you are UK based is literally everyday at the moment. The stickers are fab and we still have nearly a whole bag left over for future works of art. They were under a pound, around the ninety pence mark and well worth it – they are sturdy, of good quality and there was a huge range of animals and farm furniture in the bag (sadly no tractors for any parents who have wheel obsessed monsters) I chose to put the stickers in two bowls – one with the stickers in and one for the peeled off backs to go in. 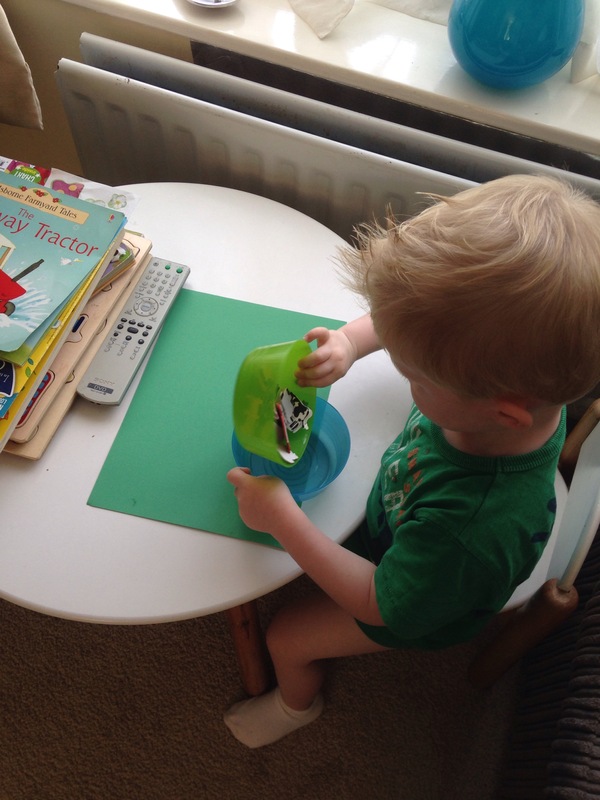 This is where J developed his own activity and spent a good fifteen minutes pouring the stickers from bowl to bowl. As Mummy tension grew (and lets face it I wanted to play with the stickers) I left him to it and used it as an excuse to pop the kettle on. Just when I thought we were going to become sticker buddies – he refused to peel the stickers off of the backs, and actually became distressed if I attempted to touch them. Instead, J played with them more like figures than stickers…in actually took me 48 hours to convince him that peeling the backs off was the best way forward. Below is his first attempt and I must apologise for any layout technicalities with the pigs (blush). 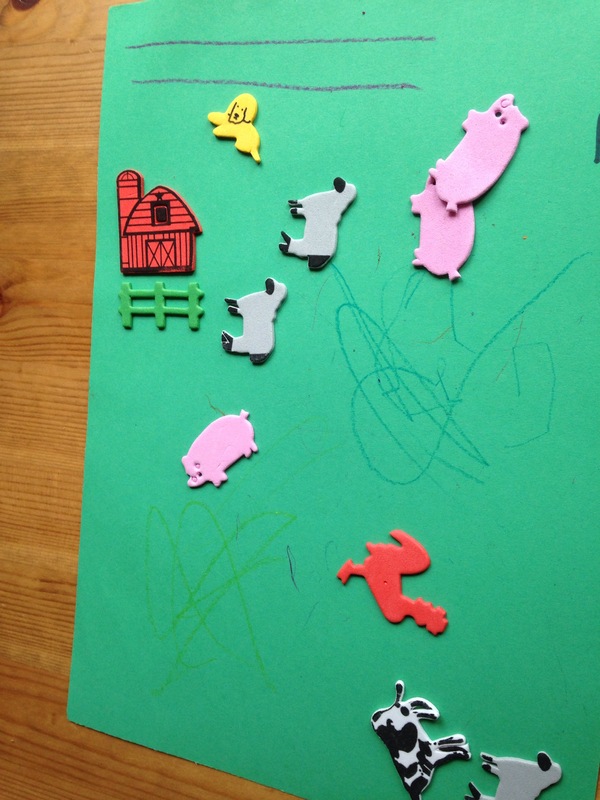 He also free styled with some crayon action – creating snacks for the ‘amin-als’ and after a quick interrogation the double lines (near the top of the page) are not as I thought ‘a fence’ but instead ‘a door for the doggy to go in the garden’. I feel stupid for even questioning such an obvious modern art phenomenon. I’m sure you could do all sorts of lovely activities with these and they would really work well in conjunction with a farm yard book or narrative task, or as we have since done, perfect for sorting activities. 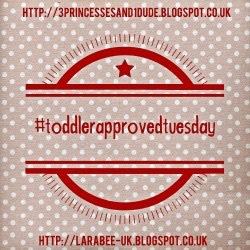 For now, we will continue to work on ‘how to use a sticker’ and Mummy will try to control every aspect of play. Thanks for popping by. < Previous You can’t act like a flip flop..
Little people keep you on your toes like that, right? Haha. Thanks for popping by.